Monday saw the first construction crews arrive on site and begin removing seats. Divided into phases, redevelopment of Miami Dolphins home ground will last until mid-2016. 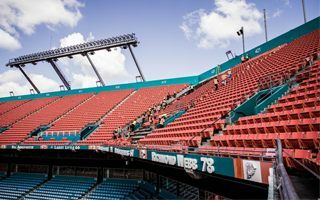 Long-expected reconstruction of Sun Life Stadium in Miami began on Monday. The project first announced several years ago is finally coming to fruition as seats are being removed from upper corners. New corporate zones and giant screens are to be placed there. Compensating for the loss in capacity, new first row sections will be created, bringing fans closer to the pitch. The stands should be converted before the upcoming 2015 NFL season. Most works will then come to a stop and restart again in January 2016, when roof construction is planned to be built atop the stadium. Supported on massive pylons built outside the stadium, the roof will be topped with 8 tall spires, a change from the original scheme that included 4 spires. The roof alone is priced at some $100 million, while entire redevelopment cost is set to be $350-400 million. The price includes upgrade or replacement of nearly all systems and equipment at the stadium.